Ian Wishart’s new book on the Treaty of Waitangi, The Great Divide, has rocketed up the bestseller lists to become the top-selling NZ non fiction title within 72 hours of release. 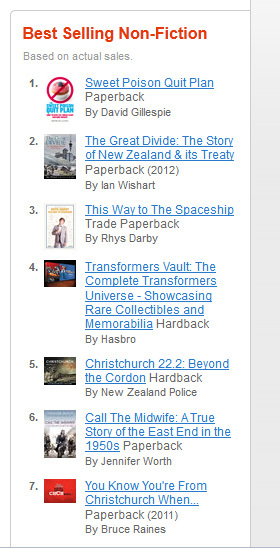 The Great Divide: The Story of New Zealand & Its Treaty, currently sits at #2 on the overall non-fiction bestsellers list for top online retailer Mighty Ape, and is the #1 placed NZ non-fiction title, ahead of comedian Rhys Darby’s This Way to the Spaceship. The book is also being positively reviewed by both Maori and Pakeha commentators. “When I opened The Great Divide I found it moderate in style, clear in expression and thorough in discussion. “Wishart…most importantly in my view, gives thorough attention to the Kohimarama Conference of 1860 which has been so notably discounted by Orange and Salmond. In Ian Wishart’s words, ‘What we see at Kohimarama…is an evolution of consent. After 20 years of partial integration, the chiefs not only ratified Waitangi in full but expressly called for a complete adoption of Pakeha tikanga’. The Great Divide by Ian Wishart goes onsale in Whitcoulls stores across the country tomorrow.